Evan Longoria is no stranger to All-Star snubs. In 2011, the Tampa Bay Rays third baseman led all players at his position in Wins Above Replacement, despite not being picked to play for the AL team. In 2013, another non–All-Star season, he ranked third in WAR at third base. Both years resulted in top-10 MVP finishes. His All-Star absences in 2014 and 2015, though — those non-selections weren’t snubs. Longoria wasn’t one of 81 All-Stars in 2014, or one of 76 All-Stars this season, because it’s been a while since he’s looked like one of baseball’s best players. It wouldn’t be accurate to call Longoria’s last couple of years a collapse. He is still an above-average hitter and above-average fielder who has played more games than any other major leaguer over the past season-plus. But compared to his previous superstar standard, Longoria’s rate of production has undergone a decline that not even his ample playing time can obscure. By FanGraphs WAR, Longoria was the best player in baseball from 2008 to 2013, at any position. Since 2014, though, he’s been the 11th-best player at third base alone, behind not only a new breed of blue-chippers, like Manny Machado and Nolan Arenado, but also lower-profile contemporaries like Justin Turner and Trevor Plouffe. Longoria is one of only 92 players in MLB history to post six consecutive seasons with an ISO over .200 in at least 300 plate appearances. Of those 92, only one, Philadelphia Athletics left fielder Bob Johnson, followed such a streak with back-to-back seasons of at least 300 PA and an ISO below .160, as Longoria appears poised to do.1 Relative to what it was over his first six seasons, Longoria’s 2014–15 Isolated Power is off by almost 100 points, a decrease that can be pinned only partly on a leaguewide drop in run scoring. 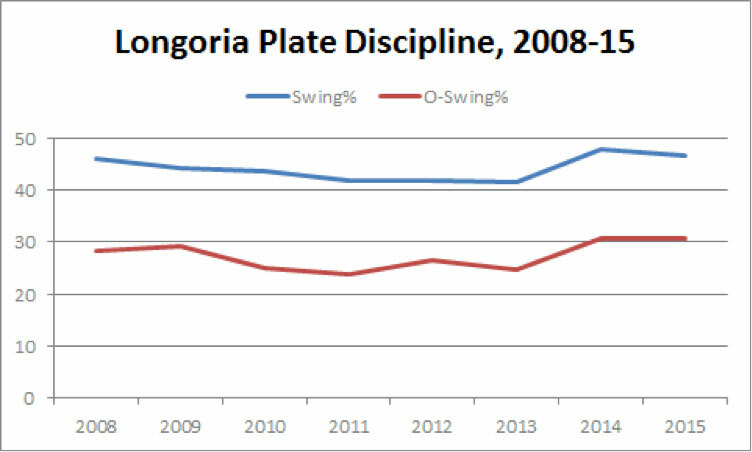 After accounting for the offensive environment, Longoria was about 35 percent better per plate appearance than a league-average player from 2008 to 2013. Since then, he’s been about 10 percent better over more than 1,000 PA. That difference, coupled with an inevitable drop-off from the stellar defensive stats of his first few seasons, has turned him from a franchise player into merely a very good one, and his high line-drive rate and BABIP don’t foretell better bounces to come. Shelton acknowledges that there hasn’t been any structural change to the Trop that could account for the dome playing dramatically differently. Nor is there any evidence of a 2014 dead zone in left center in the yearly park factors (scaled to an MLB average of 100) calculated by Tony Blengino, a former Brewers and Mariners analyst who now writes for FanGraphs. These values fluctuate significantly from season to season, but if anything, they show the Trop becoming a friendlier place for fly balls. It is true that Longoria’s greatest decline has come on balls hit anywhere but down the left-field line. While his pull power on line drives and fly balls has suffered, his ISOs to center and the opposite field have been cut more than in half. At this point, he only has pull power. In light of those numbers, it’s hard to escape the conclusion that Longoria is making softer contact. Indeed, his average batted-ball velocity, according to Sportvision’s HITf/x system (which reports lower figures than Statcast), fell from over 85 mph in each of his first two big league seasons to 81.0 in 2014. And his average batted-ball distance on fly balls and home runs has sunk from 300 feet or more from 2008–09 to about 280 feet from 2014–15. There’s no smoking disabled-list stint that would explain those stats. Longoria’s only reported injury in 2014 was a bout of forearm soreness that didn’t keep him off the field. This year, he suffered a sore wrist that cost him a few games in early June. For Tampa Bay, even a diminished Longoria is much better than the alternative: Most of the Rays’ non-Longoria starts at third base this season have gone to Jake Elmore, who’s hitting .213/.272/.303. On the other hand, a little more Elmore would be worth having if it meant getting the old Longoria back the rest of the time. That is, if the solution were as simple as a few extra days off. It’s possible that as the Rays have fallen out of the playoff hunt and been in the bottom half of MLB offenses over the past two seasons, for the first time in Longoria’s career, the ex-slugger has violated the sacred clichés of “staying within oneself” and “trying not to do too much.” His overall swing rate and his swing rate at pitches outside the strike zone reveal a much more aggressive approach from 2014-15, reversing a multiyear trend toward greater discipline. Shelton declined to comment on any changes Longoria has made at the plate, or on any tweaks he’s trying to implement now, saying, “We never talk publicly about what we’re doing mechanically.” Hitting mechanics are notoriously tough to critique, but I asked hitting coach and Baseball Prospectus swing analyst Ryan Parker to search for any sign of a change sapping Longoria’s strength. “The one thing that jumped out at me was how he used to use his lower body compared to now, and the effect that has on how his hands move,” Parker said. Here’s a video of two Longoria homers to left on pitches over the center of the plate. 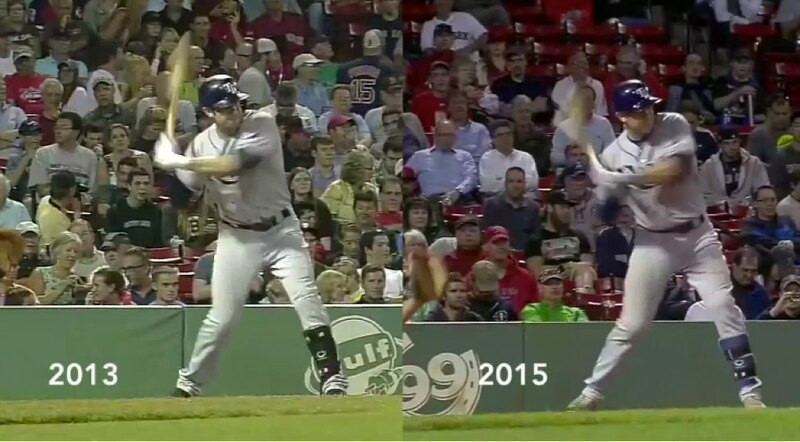 The homer on the left is from 2013, and the one on the right is from 2015. 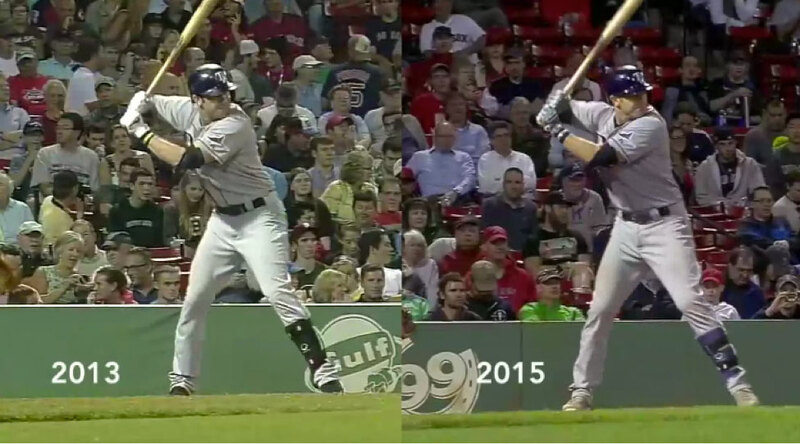 In the following GIF of a 2013 Longoria homer, Parker sees the hitter’s hips acting as a hinge, with his shoulders closer to his knees than they are in the subsequent GIF of a 2015 homer, in which Longoria stays upright longer. To my untrained eye, those differences seem slight, bordering on undetectable. To Parker’s, they’re significant but fixable. It’s possible, though, that any mechanical adjustment Longoria has made is an attempt to compensate for a loss of bat speed, which slows inexorably with age. Each summer since Longoria’s rookie season, FanGraphs’ Dave Cameron has ranked MLB players by trade value. Longoria was the runaway star of the first four years of that exercise, combining almost unparalleled present value with a below-market salary that the Rays wisely secured with an extension signed less than a week after Longoria’s big league debut. As late as last summer, Cameron included Longoria in the top 10. This year, though, the third baseman has fallen out of the top 50, reflecting both his declining performance and his escalating pay.2 Between a subject who won’t talk about injuries and a hitting coach who won’t discuss mechanics, it’s not easy to unravel Longoria’s recent past, let alone his future beyond his 30th birthday, which he’ll celebrate (or maybe mourn) in less than three months. But his quick transition from “franchise-altering asset” to “pretty good deal” is a reminder of the relatively short shelf life of a bargain-basement superstar. Johnson was 36 when his decline came, although he did have one more .200-plus ISO season in him. In Jonah Keri’s Trade Value column from the past three offseasons, Longoria has ranked, in order, fifth, fourth, and 21st.